mentioning are the simple style and the warm atmosphere of the Tenuta. Charming suggest this place to dynamic couples and families with children. 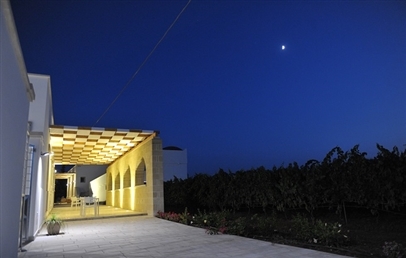 The Tenuta Flora Maria is located on the road between Porto Cesareo and Leverano, in a very quiet place just 13 km from Lecce and 27 km from Gallipoli. The town of Leverano, with its lovely old centre, rich in oil and wine, is 1.5 km far away. 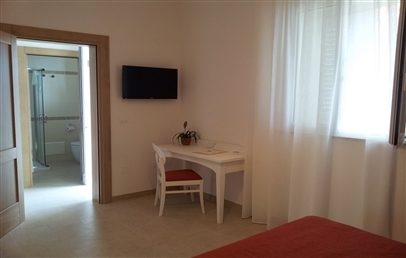 It is surrounded by vineyards, stone walls, olive groves and immersed in the fragrances of the Mediterranean vegetation and the sea breeze of the beach of Porto Cesareo, which is just 5 minutes by car. 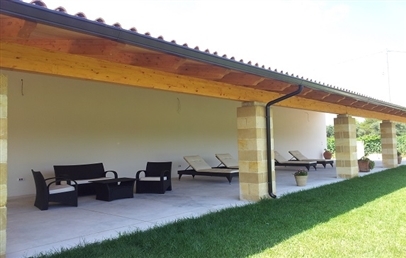 It is an old renovated farmhouse belonging to a known and respected family of Leverano. The court structure is typical of the Salento area, with a large central courtyard onto which overlook the rooms. The friendly and attentive welcome is guaranteed by the owners Angelo and Chiara, who take care personally of the guests, in order to make their stay at the Tenuta Flora Maria as pleasant and relaxing as possible. The Tenuta Flora Maria consists of 6 rooms and 3 apartments, harmoniously blend into the surrounding nature, with great attention to detail and design. Rooms – each room has a wooden porch with tables and chairs for relaxing moments. 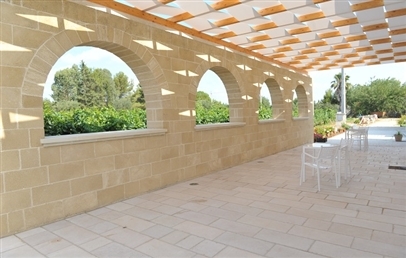 The rooms are all independent and have view over the court, the garden or the vineyard. They are divided into twin, double, superior and family. 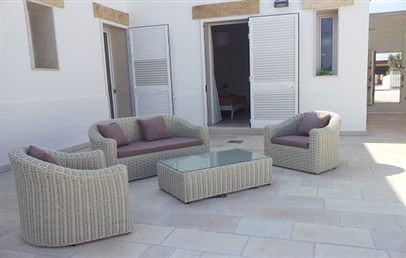 Apartments – overlooking the courtyard, furnished with seating areas and sofas. Each apartment is equipped with outdoor relaxation area with garden furniture; a fully equipped kitchenette, a car park. They are divided into Standard Malvasia, Superior Negroamaro, Superior Primitivo. Along the coast of white sandy beaches of Porto Cesareo, Tenuta Flora Maria can provide beach service to preferential rates at the partner “Lidos”. One day in advance or early morning guests can book it at the reception. In addition, the Tenuta offers complimentary beach chairs, sun umbrella and beach towels, for guests who would like to venture freely along the coast. For breakfast the rich buffet is served inside the courtyard under a large open porch, with a choice of fresh and local products of sweet and savoury food. Gluten-free or milk intolerant foods are available on request. 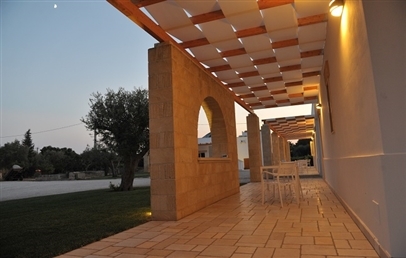 The dinner is served at the internal courtyard, with delicious Apulian recipes made of local products at kilometer zero. The dinner is served twice a week, including also tastings of renowned wines from local wineries. One of the theme night is with buffet and a Salentine folk music group with Pizzica, Taranta and tambourine who animate the evening. Guests are involved in dance with free Pizzica lessons and the rhythm of Salentina Taranta music. The owners Angelo and Chiara are glad to recommend and suggest the best restaurants in the area and the staff is happy to book a table. Cooking classes and wine tastings can be organized. Guests can use the fitness corner with treadmill and exercise bicycle, a relaxation area equipped with sun loungers and sofas to relax “al fresco” on hot summer days, jogging and cycling with jogging trails in the nature, yoga classes during the summer, massage area: reserved area in the garden for a personalized massage (on request and to pay). Parkking area and Wi-Fi connection available throughout the entire property. 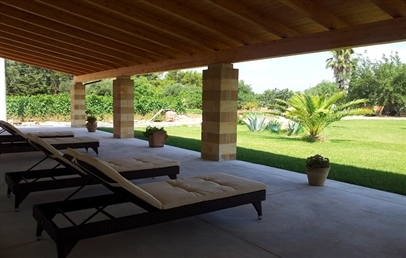 Further nice excursions can be booked to discover the territory and the architectural beauties of the province of Lecce. Double room sober and elegant, which has a spacious bathroom with shower. The room looks out onto the porch, where there is a small space with table and chairs overlooking the garden and the courtyard. Spacious room with King size bed, sober and elegant, which has a spacious bathroom with shower. The room looks out onto the porch, where there is a small space with table and chairs overlooking the garden and the court. Newspaper and bottle of wine in room upon arrival. Bright and spacious room with double bed and sofa bed. Private bathroom with shower. The room looks out onto the porch, where there is a small space with table and chairs overlooking the garden, the vineyard and the court. Bright and spacious room with double bed and double sofa bed. Private bathroom with shower. The room looks out onto the porch, where there is a small space with table and chairs overlooking the garden and the court. 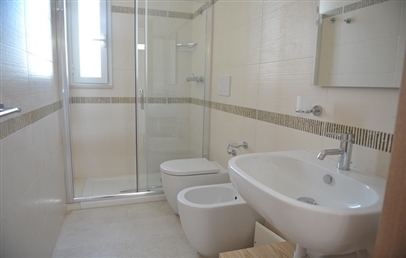 Apartment for two people elegantly furnished with attention to detail. 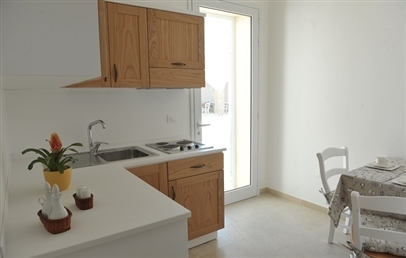 It has a small kitchen with kitchenette equipped with kitchenware, microwave, fridge and basic condiments (oil, vinegar, salt and pepper), which overlooks the courtyard. 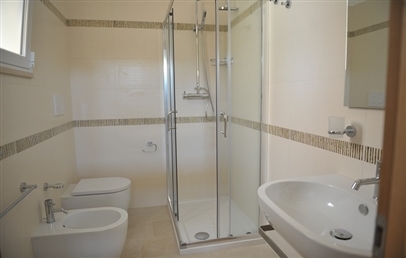 Private bathroom with shower and complimentary toiletries. Daily cleaning and change of bed linen and towels included. In front of the entrance there is a small space with table and chairs. View of the entrance courtyard, the parking and the court. 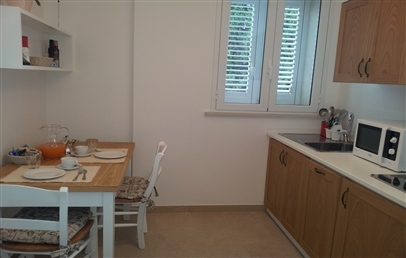 Bright apartment for three people, elegantly furnished with attention to detail. It has a small kitchen with kitchenette equipped with kitchenware, microwave, fridge and basic condiments (oil, vinegar, salt and pepper), which overlooks the courtyard. Private bathroom with shower and complimentary toiletries. Daily cleaning and change of bed linen and towels included. In front of the entrance there is a small space with table and chairs. 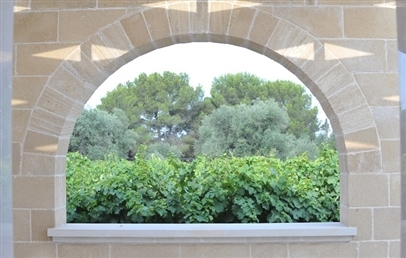 View of the court, the porch and the vineyard. 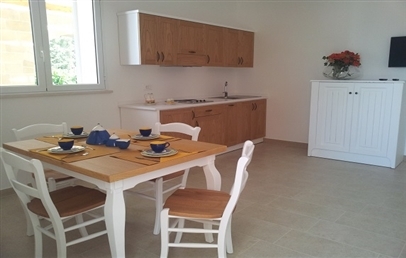 Bright apartment for four people, elegantly furnished with attention to detail. Double room with writing desk. It has a spacious living room-kitchen vineyard view with comfortable double sofa-bed and kitchenette. The kitchenette is equipped with kitchenware, microwave, fridge and basic condiments (oil, vinegar, salt and pepper) and overlooks the court. Private bathroom with shower and complimentary toiletries. Daily cleaning and change of bed linen and towels included. In front of the entrance there is a small space with table and chairs. View of the entrance courtyard, the court and the vineyard. 10% reduction for stays from April 13th to May 24th (min. 2 nights)! 10% reduction for stays from May 25th to June 7th (min. 7 nights)! € 7.00 per night in their own cot or in parents' bed (to be paid locally). Breakfast and linen included. € 10.00 per night in the hotel's cot (to be requested at time of booking and to be paid locally, breakfast and linen included).